I finished my rya! Here it is enjoying the warm sunshine outdoors this morning. The yarns were all hand-dyed by me last July (2012) using woad from my garden and Queen Anne’s Lace from garden “weeds” and from scrubby places around town (e.g., under the powerlines and along the sides of Route 9 and Main St. here in Amherst). 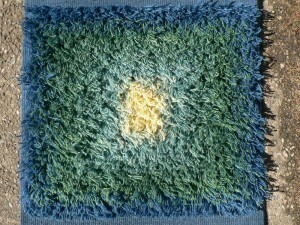 The blues are dyed with woad, the yellows are Queen Anne’s Lace, and the greens are Queen Anne’s Lace overdyed with woad. The mordant is aluminum sulfate. The yarns are single ply rug wool. Each knot is made with three strands of yarn. 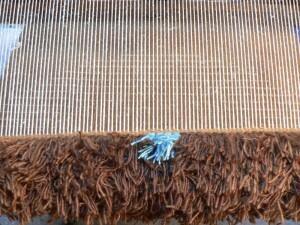 The warp is 8/4 unbleached linen. This is my 100th post, and I feel very pleased to have made something so pretty to share on this occasion. I have sewn up a few more books with the Hop Vine pattern on the cover. One was actually sewn in Maryland on February 20th, where I was visiting my sister who is about to have her second baby. From there it was promptly mailed off to Arizona, from whence it will travel to Ohio. Not a carbon-neutral book, alas. However, it was blessed by the paw of the Pippi, so I’m sure its sins are forgiven.